A 1ct Engagement Ring & Diamond Fitted Band Set. Made in platinum to our inverse spiky design. It is set with a 1ct FVS2 diamond. 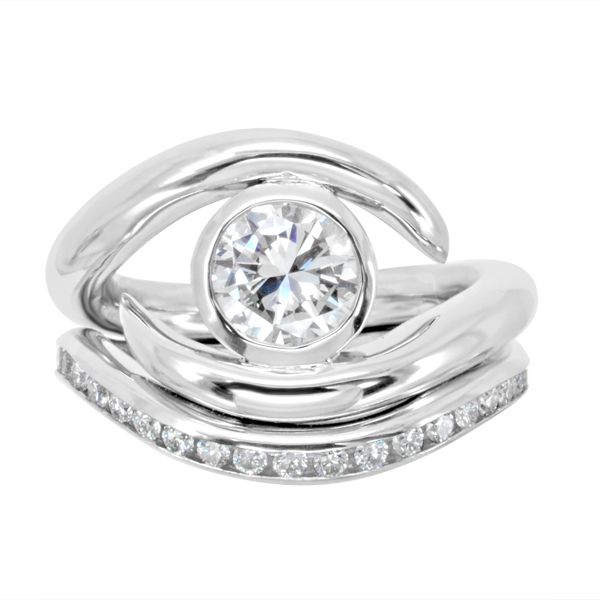 The fitted diamond wedding band makes a beautiful alternative to a plain wedding ring. It is set 60% of the way round with twenty 0.5ct round diamonds totalling 1ct complimenting a really unusual engagement ring. The rings are available separately, please quote 12000059 for the engagement ring which is priced between £7500 and 9000, the size of the diamond you would like or your budget, and your ring size. For the diamond channel set wedding or eternity band please quote 14000024 when ordering. The guide price is £1800 depending on your ring-size. This ring needs to be made to fit exactly to your engagement ring. Either commission them to be made together or drop your engagement ring back to us for a day.